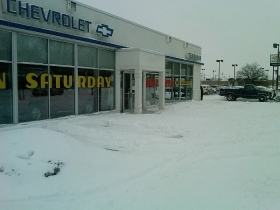 Midwest auto dealers, such as Tennyson Chevrolet in Livonia, Mich., were digging out this morning from the snowstorm that blanketed a major chunk of the nation. Several automakers canceled shifts at assembly plants. Weather-related parts shortages have started to take a toll on automakers, as 33 North American plants remained shuttered for first shift production today following a massive winter storm that roared through the Midwest. Detroit's Big 3 automakers accounted for 26 of the closed facilities. Chrysler canceled first shifts at 12 plants today due to parts shortages, but plans to reopen all but one later in the day. Ford reported weather-related parts shortages at four facilities. Getting parts to factories on icy, snowy roads has also been a problem for Subaru and Toyota plants in Indiana. General Motors and Honda have not yet reported parts shortages, but it could become an issue. De Koker, whose organization represents 290 original equipment suppliers across the country, said delivery is more of a problem than actual production. He said this has been a problem particularly for facilities in Ohio and Indiana, which were doused with rain that later froze in cold temperatures. At Robert Bosch LLC, things are up and running at manufacturing facilities in spite of the snow. The Farmington Hills company recorded $3.33 billion in sales in 2009. Its German parent company Robert Bosch GmhH is ranked No. 2 on Automotive News' Top 100 Global OEM Parts Suppliers with $25.62 billion in sales in 2009. While most of Bosch's manufacturing facilities were not hit by the winter weather, some plants and offices have seen higher absenteeism. “We are not expecting that to be a sustained problem,” said MacDonald. As the storm hit the manufacturing heartland yesterday, automakers were reporting solid sales gains for January in a sign that the industry is continuing to recover from the collapse of 2009. In some cases, the storm could actually help suppliers that may have fallen behind in production, said De Koker. Many plants were already facing parts shortages before the snow and ice hit. If the real issue is shortages of raw materials like steel, rubber and resins, then a snow storm probably wouldn't have much effect overall, he said. • Detroit Hamtramck, which runs a single shift, will be closed today. The plant makes the Chevrolet Volt, Buick Lucerne and Cadillac DTS models. The plant will reopen tomorrow. • The Lansing Grand River and Delta Township plants in Michigan have been closed today. The Grand River plant produces the Cadillac STS and the CTS coupe, sedan, wagon models, and will reopen tomorrow. The Delta plant produces the Buick Enclave, GMC Acadia and the Chevrolet Traverse, and reopened for a third shift today. • The Orion Township, Mich. plant will be closed today. It produces the Chevrolet Sonic (Aveo) on one shift. It will reopen tomorrow. • The Fort Wayne, Ind., plant canceled today's first and second shifts, after canceling its third shift Tuesday. The plant produces the Chevy Silverado and GMC Sierra has reopened for the third shift today. • GM's Fairfax (Kansas City) Kan. plant has resumed production on its third shift, after canceling the first two today. The plant, which produces the Chevrolet Malibu and the Buick LaCrosse, was shut down for the second and third shifts yesterday. • GM's Flint, Mich. assembly plant will reopen tomorrow for all regularly scheduled shifts. A first shift has been rescheduled for Friday, Feb. 4 to make up for lost production after the first shift was canceled today. The plant produces the Chevrolet Silverado HD crew cab and LD regular cab as well as the GMC Sierra HD crew cab and LD regular cab. • The Wentzville, Mo., factory, which makes the Chevrolet Express and GMC Savana on one shift, will reopen tomorrow. They remained closed today after being shuttered yesterday. • The first shift was canceled at the Arlington. Tex. plant today, although they are trying to get production up and running for the second shift. Yesterday's first and second shifts were canceled. A decision has not yet been made on whether the plant, which produces the Cadillac Escalade, Chevrolet Tahoe and GMC Yukon, will be open tomorrow. GM said none of the closures were due to parts shortages from suppliers. • Parts of the operation line at the Dearborn Engine Plant, have continued to run today, while the rest of the plant is closed. The facility was scheduled to be down on Friday but shifts will be made up on that day instead. The facility produces the Ford F-series chassis. • The Dearborn, Mich. truck plant, which produces the F-150 and the Harley Davidson F-150 will not run the day shift today because of weather-related parts shortages. The afternoon shift will run as scheduled. • Both shifts today were canceled at the Lima, Ohio, Engine Plant due to a weather-related parts shortage. • Ford's Kansas City, Mo., assembly plant has been closed all day due to parts shortages caused by the weather. The move affects the F-150 pickup and the Escape production. Ford closed the plant for the evening shift yesterday. • The Chicago Assembly Plant has canceled its afternoon shift today because of the weather. The plant produces the new Explorer, Taurus and Lincoln MKS models. • The AutoAlliance International plant in Flat Rock, Mich., will be down all day today. The Ford Mustang and the Mazda Mazda6 sedan are produced there. • The Ohio Assembly Plant in Avon Lake will also be closed all day today due to a parts shortage caused by icy roads. The plant produces E series vans. Ford spokeswoman Marcey Evans said the other Ford plants that have second shifts will run them today. • Global Engine Manufacturing Alliance (GEMA), Dundee, Mich.
All Mopar Parts Distribution Centers will also operate tomorrow, including Chicago and Milwaukee centers, which were closed today Due to parts shortages, Chrysler canceled its first production shifts at its manufacturing facilities today. Eleven plants reopened for second shifts, while the Belvidere plant remained closed throughout the day. • Toyota's manufacturing plant in Princeton, Ind. will be closed today due to a parts shortage. The facility produces the Sequoia, Sienna and Highlander models. • Subaru has canceled three production shifts today at its Lafayette, Ind. plant because of a parts shortage. The plant, which makes the Subaru Legacy, Outback and Tribeca as well as the Toyota Camry, canceled its second shift yesterday. In response to the closure, Thursday's first shift will operate on an altered 8:00 a.m. – 4:30 p.m. production schedule. Subaru said this is because they are hoping roads will be cleared for the later start time. • The plant in Normal, Ill., closed at 1:30 p.m. local time yesterday and will remain closed today. Mitsubishi intends to reopen on Thursday. • Honda plants in East Liberty and Marysville, Ohio have closed for today. The East Liberty facility produces the Honda Accord Crosstour, CR-V, and Element. The Marysville facility produces the Acura TL and RDX as well as the Honda Accord I4. Both plants will reopen for production tomorrow. • The Greensburg, Ind., plant, which builds the Civic Sedan and natural gas Civic on one shift, has canceled production today due to the weather. Honda said none of its facilities were experiencing parts shortages from suppliers.